Who needs iPad 2 rumors when there is iPad 3 to talk about? 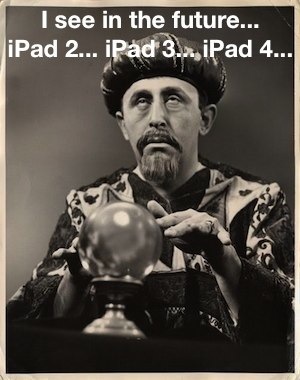 The iPad 2 might be in production but it hasn’t even been announced yet. Regardless, that’s not stopping the hungry Apple rumor mill from talking about the model to be released after that… iPad 3. Talk of iPad 3 started when John Gruber of DaringFireball made a passing reference to the future device, which was quickly picked up by AlleyInsider and TechCrunch who cited that as a source for the products release schedule. Now when I make actual guesses, some people (not unreasonably) think I’m being coy and actually releasing information that I know. Henceforth, when I say I’m guessing, I’m really guessing. In other words, Gruber is not channeling Steve Jobs and Apple’s super secret release schedule from a crystal ball, although that is amusing imagery to consider. Thus, my gut feeling is that Apple will move the iPad to a September release schedule, alongside the iPods. Now this theory I like more, the idea that another iPad will join, not replace, the existing family members, maybe as a smaller 7″ iPad model or a ‘pro’ model with a retina display. This could broaden the product line and makes Apple’s arsenal more competitive in the tablet wars. Is this guesswork and speculation worthy of the surge in iPad 3 chatter that is flooding the web? That’s debatable, but Gruber is known to be somewhat well connected to Apple. At the same time, he can also just have an opinion and take educated guesses like the rest of us, and there’s nothing wrong with that either. But enough about iPad 3, where’s the iPad 4? Slow news day? Apple rumors are out of control, they’re clearly made up to get attention. You’re taking the bait too. The only good thing about this article is that image.